At the turn of the last century, South America seemed poised to make the same economic leap as the northern half of the hemisphere. Fueled by booming exports of grain, cattle, coffee and rubber, Brazil and Argentina saw their economies grow rapidly and at one time both stood among the world's ten wealthiest nations. All that cash led their leaders to seek the prestige symbols of the day: dreadnought battleships. Argentina, Brazil and Chile all built dreadnoughts just like the Great Powers, but none of them ever fired a shot at a foreign enemy. 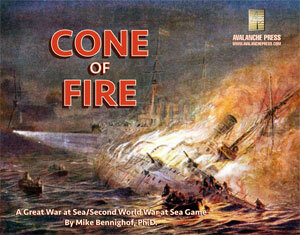 Cone of Fire is a boxed game for both the Second World War at Sea and Great War at Sea series. The fleets of Argentina, Brazil and Chile plus those of Peru and Uruguay are added to both series, along with ships from Germany, France and Britain. Most of the scenarios, or game situations, are based on hypothetical situations arising from the actual war scares between the South American nations and sometimes European interlopers, and the war plans with which they addressed them. There are also scenarios based on the actual conflicts which took place in South American waters: the hunt for Admiral Maximilian Graf von Spee's German cruiser squadron in 1914, and the hunt for the cruiser that bore his name 25 years later. Alongside the ships actually operated by the South American naval powers, there are also ships they ordered and did not receive, or contemplated but did not order. The Brazilians have several projected classes of battleships that they never completed, as well as the modern warships they sought from the U.S. Navy during World War II. Argentina and Chile have their projected battleships, carriers and cruisers as well. And there are the actual jet aircraft flown by Argentina and Brazil. 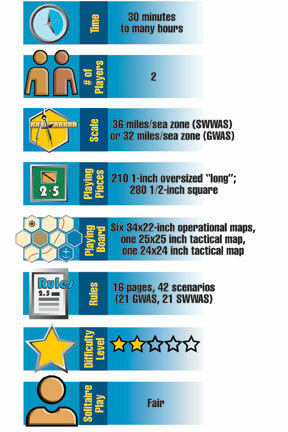 There are six maps, three at Second World War at Sea scale, and three at Great War at Sea scale. 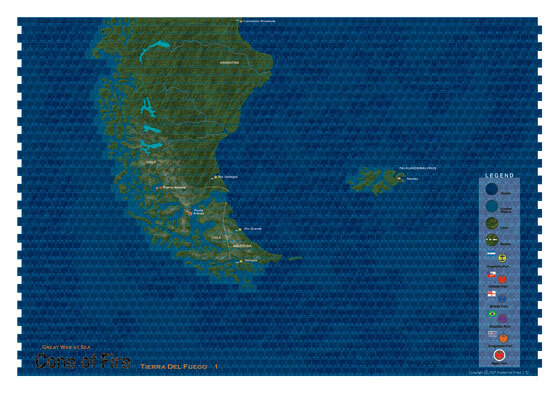 These cover the region from south of Tierra del Fuego, the southernmost tip of the Americas, to well north of Rio de Janeiro. There are huge stretches of ocean as well as the narrow, winding channels of the Chilean coast. You can learn to play Great War at Sea in just five minutes with this demo. You can learn to play Second World War at Sea in just five minutes with this demo.